An American Custom favorite. 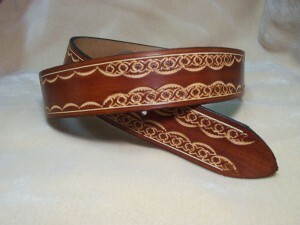 This beautiful belt has the natural leather showing through on the tooling, Great for Men or Women. Shown in Dark Brown, ( 2nd pic British Tan, and 3rd pic is Natural Brown). If you choose to have your name on the back of your belt it will appear in black.